A babbler is a bird, with the common name seven sisters in English and seven brothers (saath bhai) in Hindi. The common names come from their propensity to hang around in groups , and often very noisy groups (hence "babbler"). is an Old World babbler found in the Indian Subcontinent. They are gregarious birds that forage in small groups of six to ten birds, a habit that has given them the popular name of Seven Sisters or Saath bhai in Hindi with cognates in other regional languages which means "seven brothers". 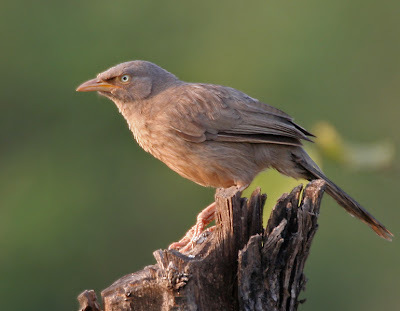 The Jungle Babbler is a common resident breeding bird in most parts of the Indian Subcontinent and is often seen in gardens within large cities as well as in forested areas. In the past, the Orange-billed Babbler, Turdoides rufescens, of Sri Lanka was considered to be a race of this babbler, but is elevated to a species. The species was described in 1823 under the name of Cossyphus striatus and was based on a specimen from Bengal. These birds are gregarious and very social. They sometimes form the core of a mixed-species foraging flock. They feed mainly on insects, but also eats grains, nectar and berries. The groups maintain territories and will defend it against neighbours but will sometimes tolerate them.For their size, they are long lived and have been noted to live as long as 16.5 years in captivity.
. WKD : THE BIRD SAIJIKI .